Does anyone remember what the shop was called when it first opened as a record shop. I can remember going in there and buying Split by The Groundhogs. I’m sure(ish) it began with an “E” and was something like “Esperanto” or “El Dorado” but it wasn’t actually either of them if you know what I mean. The name of the shop was Expansion Records. 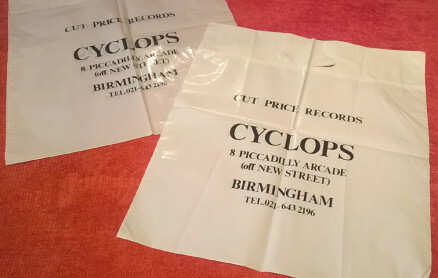 Run by Moses & Wurz and occassionally Phil before being taken over by the Welshman from a second hand bookshop in Digbeth and the name changed to Cyclops Sounds – when it ceased to be a pleasant place go. having to deal with the type of people who frequented his establishment. Peter Riley (aka Moses) now lives in Tokyo, Japan. The Welshman, who took over from was a Mr. Jones. But they had all the great LP’S at very good prices, saturdays were always special..Even though they were horrible people it was fun winding them up cause they had’nt got a clue which band was which..great days indeed. I remember Dylan ’78. Sat. evening the queue started until it was out the bottom of the arcade and spreading up into New St. My mate, brothers and I got roped in to control it overnight at request of the police. A lot of stories of Roy Jones are true, he could be a difficult person but to call him and my mother Nazis is very insulting. My mother is now 91 and I’ll pit her against you in a rock knowledge quiz anytime. Roy’s bark was worse than his bite a and Mrs cooper was a very charming and polite lady. I used to work as a rep for poydor records and had to call at the store on a regular basis, I was always made several cups of coffee and made to feel welcome. I once went into Cyclops and found they had Street rats and Smokin’ by Humble pie at £2.49 each. I asked the miserable troll owner to keep them behind the counter while I went to the bank. Upon my return half an hour they were £3.99 each !! Great selection of music, horrible proprietors ! I went in to buy “Back Into The Future” by Man. I asked to hear it, he said “Are you going to buy it?” I said yes but when he played it the arm on the turntable was bouncing all over the place. I said I did not want that one so he grabbed another saying it was just a bad pressing so again I asked to hear it, he said get out of my shop! His partner (wife?) on the other hand was a lovely person and would play albums with no pressure to buy. I have a memory of buying ‘Young Americans’ by David Bowie from Cyclops. Piccadilly Arcade. The owner was welsh, lacked patience, not the sort of record shop that you could browse in easily. He also had a penchant for eating a slab of hot buttered toast, so that when you presented him with the sleeve, he would reach up and get the vinyl from the shelf, leaving greasy marks on the record. Whenever I play ‘Young Americans’, it brings back the depressing decade of the seventies, when spending whatever money you had back then, was in Cyclops. Wasn’t he a foreign geezer? I used to go there every Saturday, until the miserable (foreign guy) accused me of shoplifting. You couldn’t even swing a cat in there yet alone try to do a runner with anything! 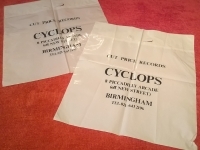 I spent lots of time and money in Cyclops Sounds in the early 1970s. Hardly ever saw the Welsh proprietor, but was often served by the nice middle-aged lady who I believe was called Mrs Cooper. (She was sometimes seen with a record stall at the Town Hall). I bought the Beatles’ LP ‘Hey Jude’ there, but it was faulty so took it back. They didn’t have another copy, so I had a credit note, with which I eventually bought ‘Foxtrot’. This monumental album began a love affair with prog-rock which has endured to this day (saw Camel in Wolverhampton a few weeks ago). You often hear the ’70s described as a miserable decade, but those years were among the happiest of my life. Which presumably confirms the old cliche that life is what you make it! 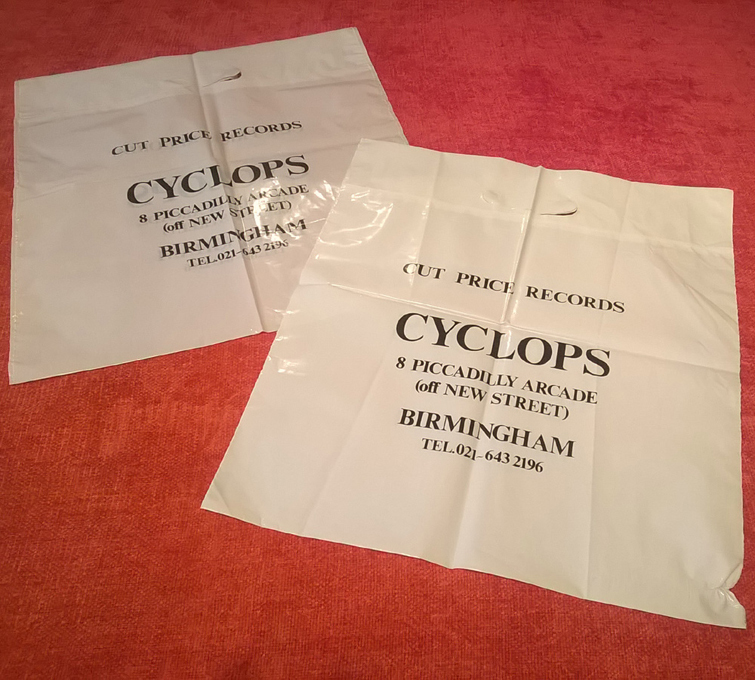 Cyclops was in Piccadilly arcade I believe. Good prices and good for gig tickets too. However I do remember that the owners inspected each LP when you bought it. This led to a difficult return visit if it turned out to be faulty! And yes, the owners definitely had a reputation! And that’s how I can identify any 1970s lp by the top 3mm of the front cover. When we queued all night for bob Dylan tickets in 1978 he came out with hot drinks for everyone and was nice as pie. So there you go. Never walk in with a Virgin bag! Sorry son we’re closing for dinner 10.30am.!! Close the door Bob. Mother stored all those posters in the garage. One day she and her partner decided to clear them and burnt the lot! Can you guess what they’d be worth now? Got one left. UB40 at Walsall FC supported by Toots and the Mayalls, Gang of 4. June 13, 1984? I remember going in Cyclops to get tickets for The Jam at Bingley Hall, first off me and my mate were looking through some albums and the aforementioned gentleman asked us if we intended purchasing anything otherwise we would have to leave. Upon asking for Jam tickets we were told it had sold out and no more ticket were available. We asked if he knew how to get to Virgin records to which the reply was “Never Heard Of It” We eventually found Virgin where we were served by friendly staff AND got our Jam tickets. I worked there on Saturdays when it was called Expansion Records. Nothing but fond memories. I think we had the odd bootleg under the counter. I cannot remember precisely the year, I thought around 1973/4. I was barred from the shop. Looking back I think it was justified. A chap had asked for an LP which was not in stock. I then offered to sell him a spare copy of my own whilst still in the shop. Get Out and do NOT return was the response. A bit of a shame as it was a good alternative to the Diskery. Even the people there could be a bit touchy depending on the prevailing mood but they always let you listen to the records first. As a schoolkid in the early 70s, I found out about this shop from friends. I think I bought the majority of my vinyl collection from him. Starting work in September 74 meant a visit to the shop on Payday Thursday or/and Saturdays. Never had a problem with the Welsh gent or the lady that worked in the store. I must admit he cut me some deals with the amount of stuff that I purchased from him. All memories now. All that vinyl got sold on when CDs took over!